In the 14th century, the Indian mathematician Narayana wondered how many cows there would be after twenty years, when each cow would produce one calf a year, that, having grown into a cow after for years, would equally produce one calf a year. In 1969, Narayana's problem inspired Tom Johnson (°1939) to compose his popular 'Narayana's cows'. Within the reigning discourse, this creation is regarded is one of the newest branches on the tree that has its root in Josquin and its trunk in Monteverdi, Bach, Haydn, Mozart en Beethoven, Liszt, Wagner en Brahms, Mahler, Schönberg en Strawinsky. Let us examine in how far this approach is justified. Tom Johnson's composition consists of two layers: a verbal and a musical. In the verbal layer, we do not hear a musician, but a speaker who transposes Narayan's numbers in words: 'The first year there is only the original cow and her first calf. The second year there is the original cow and two calves. The third year there is the original cow and three calves. The fourth year the oldest calf becomes a mother, and we begin a third generation of Narayana's cows.' And so on, until the seventeenth year. At first sight, this seems to be a narrative, but on a closer look, it appears that we do not imagine cows and calves grazing on green meadows in increasing numbers, but rather nothing at all, and when something, than rather numbers or icons of cows. The speaker is, hence, no narrator - his words do not conjure up mental images - at best, his transposition in words refers to the consecutive transposition in sounds. Such purely discursive text can be artfully verbalised. The emphatic repetition lends the text an outspoken rhythmical - 'musical'- character (like with Gerhard Rühm's Zahlengedicht'). That is why it belongs to 'literature' in the sense of 'interesting qua use of language'- or, to phrase it more precisely: literary design. Verbalisation and sonification can be compared with the more familiar visualisation: think of temperature curves and graphs. We could complete the verbalisation and the sonorisation with a visualisation on a screen, whereby cows would be represented with a big square and the cows with a small square inside, and the various generations with different colours - like in a picture of Albers. The idea to make such transpositions does not just appear from nowhere. It originated in dodecaphonic music, where the twelve semitones were equaled with numbers in a series, which could autonomously - without concern for what they then express - be subjected to diverse operations like spatial and temporal mirroring. In serial music, such series were transposed not only in tones, but also in lengths, dynamics, and colours (Babbit), and composers like Luigi Noon played with the idea of extending the transpositions to coloured light (Nono Prometeo). With John Cage, the Schönbergian row is replaced with random series, and with Xenakis with mathematical formulas. From then on, artists proceeded to transpose the most diverse materials in sound: from 'visual scores', over sonorisation of cosmic radiation or human movements (Christophe de Boeck Steel sky), to the sonorisation of the number Pi or Pythagoras' theorem. Although this evolution seems to be a lineair process - unstoppable progress - it actually entails a rupture. Initially, we are dealing with the endeavour of the artists to compose their images - through resorting to often mathematical principles like symmetry, progression, permutation, and the like - just think of da Vinci's Vitruvian man. 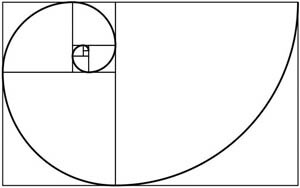 But, gradually, the use of mathematics or geometry becomes a vehicle of the antimimetiic fervour that wreaks havoc in the arts, especially from the end of the nineteenth century onwards. No longer the human body is appreciated in the Vitruviusman, but only the proportions. And these can only be done full justice, when the detour over the body is omitted: far more appropriate are visible or audible analoga - just think of Mondrian's squares and cardinal colours. Not otherwise than figuration in the visual arts, expression is rejected in the name of an autonomous composition. In both cases there is no longer a place for composed images - say: 'applied compositions' - but only for compositions that are no longer subordinated to other objectives - say: 'fine compositions'. We could compare with the designer who would no longer design a chair that is well composed, but just an object that is enjoyed for the pure beauty of its composition - just think of the beauty of geometric figures, or of the golden section curve below the title of this text. No doubt, the music of Tom Johnson is music, but no longer the mimetic music in the tradition of which he inscribes himself. It belongs to the world of musical design. And, no doubt, his text is literature, but not mimetic literature - no verbal self-image (lyric poetry), and neither narrative literature. And the third visual layer, which we could add to his creation, would equally not belong to the visual arts, but to the world of visual design. Narayana's cows is hence a combination of verbal and musical design. No 'fine' musical design hence, but unintentionally 'applied' musical design of movement-conjuring signs (dance music or play music). Just like with any dance music that is performed without the dancers, we could consider the isolated musical layer of Narayana's cows as the audible appearance of the corollary audiovisual dancers, and hence as the aural image of the encompassing audiovisual appearance of music and dancers. But the emphatic presence of the verbal layer utterly prevents such lecture - and would bereave Johnsons creation of all the charms that it possesses as an object of design at that. This contention is a double mystification. First, in Tom Johnson's composition only the numbers of Narayana are 'trouvé': his contribution is not to recite the formula, but to transpose it in words and sounds. That is why 'Narayana's cows' does not belong to the domain of found objects - displayed reality- but rather to the realm of musical design. Just like one can testify of 'the art of finding interesting objects', one can also demonstrate 'the art of designing interesting objects'. And to complete the mystification: none of these arts is 'art' in the genuine meaning of the word: the art of making images. 'Narayana's cows' does not belong, hence, to the domain of the mimetic music like that of the masters of whom he regards himself to be a heir. That he inscribes himself in a tradition that he at the same time wants to negate, betrays that Tom Johnson is not interested in composing - designing - as such. By exorcising the mimetic - expression - he is rather out at making an important step in the ritual of the permanent vicarious revolution. He and his adepts enjoy not so much the design-aspect of this music, as rather the fact that this 'non-expressive' design resounds on the stage where otherwise expressive - mimetic - music used to resound. That is why it is so important that this music, which does no longer want to be the emperor, nevertheless wraps itself in imperial clothes. The theoretical counterparts of such travesty is Nelson Goodman's theory, which assimilates image and sign, and hence is unable to distinguish Hokusai's Fujiyama from a temperature curve, not otherwise than Tom Johnson, who would have us believe that melodies like those in Mahlers 'Der Abschied' do not differ in principle from his aural analogies of a series of numbers. © Stefan Beyst, october 2016.